Pumpkin Recipes Perfect for Halloween! | Winners Drink Milk! Can a Rookie Win the Indianapolis 500? She milks cows, she shoots hoops, she's our Miss America! The Drink of Milk in Victory Lane For over 70 years, winners of the Indianapolis 500 have celebrated in Victory Lane (now Victory Circle) with a hearty swig from an ice-cold bottle of milk – a ceremony recognized around the world as unique to the Indy 500. In an interview shortly before his death in 1995, Meyer recalled that his favorite beverage during his driving years was buttermilk and that’s what he asked for following the second of his three wins. Three years later, on the occasion of his third 500-Mile victory, he was photographed drinking milk in Victory Lane. Several years after that, the Bottle of Milk became a permanent part of the post-race celebration when Anton “Tony” Hulman decided that milk was a wholesome and appropriate beverage for Victory Lane festivities. For those who may be wondering what the winning driver drinks, it’s no longer buttermilk. Today, it’s delicious, nutrient rich, ice-cold milk served in a glass quart bottle. The American Dairy Association of Indiana and its Indiana dairy farm families are responsible for ensuring that the Victory Circle tradition endures and prospers. In fact, Sports Illustrated magazine has recognized the bottle of milk given annually to the winner of the Indianapolis 500 as No. 1 among the "sports world's coolest prizes." Pumpkin Recipes Perfect for Halloween! Here are some Spooktacular pumpkin recipes I found and wanted to share with you! They would be great for Halloween! In a small mixing bowl, briskly combine vanilla yogurt and raisins until yogurt becomes looser texture. Reserve. For the pancakes, combine flour, sugar, baking powder and cinnamon in a large mixing bowl. 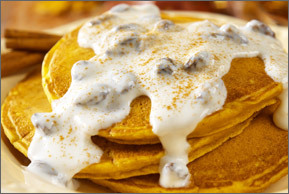 In a medium mixing bowl, combine milk, butter, egg, pumpkin, and yogurt, mixing well. Add wet ingredients to flour mixture and stir until just moist. Do not overmix. Batter may be lumpy. For thinner batter, add milk. Lightly coat a griddle or skillet with cooking spray and heat on medium. Using a quarter-cup measure, pour batter onto hot griddle. Cook until bubbles begin to burst, then flip pancakes and cook until golden. Serve warm, topped with yogurt-raisin mixture and dusting of cinnamon. Place a large saucepan of water over high heat. Cover and bring to a boil. While the water is coming to a boil, combine the pumpkin, broth, sugar, butter, garlic powder, ginger, cinnamon and nutmeg in a medium saucepan and stir to combine. Place over medium heat and bring to a simmer, stirring occasionally, until the butter melts and the mixture is heated through, about 10 minutes. When the water comes to a boil, add the ravioli and cook according to package directions. Drain and set aside. Just before serving, stir in the sour cream as desired. 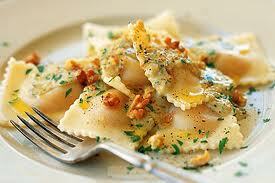 Serve the ravioli on individual plates, top with pumpkin sauce and sprinkle with Parmesan cheese. 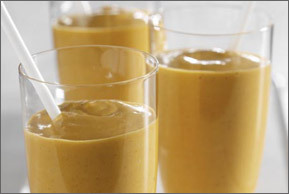 Place all ingredients (except graham cracker crumbs) in a blender and blend until smooth. Pour into glasses and top each serving with a teaspoon of graham cracker crumbs, if desired. YES! I love pumpkin! Can’t wait to try the pumpkin pie martini and pumpkin bars..
Sign up for RSS feed.